Open letter to Jimmy Carter: Don't you have any shame? I have just read that you are planning a trip to Venezuela sometime in April, depending how the rioting goes. Right... I also learned that you have written to Maduro and Capriles, arguably the leaders in Venezuela. In particular I note this sentence to Capriles that was picked up by newspapers: "send signals of their willingness to alleviate the present state of tension"; though in all justice you also wrote the following: "It is difficult for elected officials from opposition parties to resolve differences when they feel threatened and persecuted". However, that you assume that in Venezuela today the opposition has concessions it can make do betrays an extremely poor understanding of the situation. Or utter cynicism, your choice. Please, desist from your trip: you have absolutely no credibility in Venezuela. Here is why. Your last actions in Venezuela have had disastrous results for the democracy here. When these became obvious you remained strangely silent for years, and only suddenly you wake up again. I will summarize just three of them that would require from you the most sincere apology and attempts to make amends if we are ever to consider you seriously again. You promoted in 2003-2004 a discussion table so that we would go to a recall election. We should have never had to negotiate on that since it is a constitutional right. But your "negotiation" gave in fact the ability to the regime to manipulate the conditions for that right as it pleased, resulting not only in electoral fraud but also into the Tascon List which it is still in application today. I have yet to read an unambiguous stern condemnation of the Tascon List from your part. In case your forgot, the Tascon List was the list with the names of the millions that signed for a recall election and who since have been actively discriminated against by the regime. Also, the members of that table that you were supposed to protect have done poorly since, without a word of protection from you. In short, your lenience toward Chavez then was a nice stepping stone for the abuses that came later. You called very early, too early, the result of the recall election of 2004 as fair. You always refused to look at the statistical evidence presented by many people that questioned the quality of the result. By doing so you gave an argument to Chavez supporters around the world that this was the "best" electoral system even though with time even the Carter Center has come to acknowledge some problems. Following this laxity we got an outright stealing of election in April 2013 that we are waiting, by the way, for the Carter Center to at least make a strong "exhortation". In short, your blind eye to early electoral violations have not only allowed for Chavez autocracy to consolidate but has allowed Venezuela to lose free and fair elections altogether. A few months after the recall election you interceded so that your friend and noted narcissistic opportunist Gustavo Cisneros would not be hurt too much by Chavez after his initial opposition. Maybe you wanted to keep fishing pabon in peace with him? Whatever that meeting was it started with the political self neutering of Venevision network, which was followed by the closing of RCTV, its main business competition and little by little in the end of freedom of expression and information on the air waves of Venezuela. Have you ever expressed regrets? Cisneros certainly has not. In short, you are in part, large part maybe, responsible that in Venezuela today we have lost freedom of expression. Based on these three items I shiver at the thought of what future calamity your announced visit would bring to us. Maybe the validation of concentration camps so that protesting students could cool off for a few years while not endangering themselves or the community? Note: this does not apply necessarily to the Carter Center who could be considered for future elections as it has shown signs to finally understand how unfair elections are. They do not have credit or trust in Venezuela but they can still do amends if they operate together with objective organizations like the European Union observers. But you, we do not want. If you were to persist in coming after this letter I promise to do my best to counter your visit, circulating petitions, picketing myself your hotel if needed, even if the Nazional Guard of Venezuela starts beating me up because of you. The broken silence in Venezuela is deafening as the once proud and strong nation is facing mass protest demonstrations, many of which have turned deadly over the past three weeks. And the violent situations are exacerbated with the threat of anti-government protesters clashing with pro-government groups and/or security forces.Thousands of citizens have taken to the streets in cities throughout Venezuela, to stand boldly as military, police, rogue security officials and violent civilian pro-government enforcers moved in with aggressive maneuvers and weaponry. Much of the nation’s message is that they will no longer be silent after 15 years of repression and corrupt iron-fisted rule. The official death toll is inaccurate -- actually it is unknown, this due to the massive government crackdown on media coverage. Hundreds have been injured, hundreds more detained, many are missing, a number of the dead have been killed by tactical-style shots to the head by snipers. As well, pictures coming out of Venezuela taken by citizens and disseminated worldwide via the Internet show what appear to be military and police firing randomly, as well as up at apartment buildings and their balconies. Graphic pictures of beaten victims and bloody corpses have strewn the Internet. And while President Nicolas Maduro should be urging restraint and tolerance, especially of his government enforcers, while allowing freedom of expression and calling for peaceful demonstrations, with a straight face (as the late Hugo Chavez frequently did before him) he is instead accusing the United States of organizing this movement against the nation, and he claims the goal is a coup d'état. Referring to protesters in the region of Tachira last week, Maduro said, “If I have to declare a state of exception, I’m ready to declare it and send in the tanks, the troops, planes, all of the military force of the country.” He also threatened to jail other opposition politicians and protest leaders – and he has done just that. Much like his predecessor and idol, Hugo Chavez, Maduro rejects any action or words that are not consistent with tight presidential rule and mandates. Voices of the people in opposition are not welcome, they must not be tolerated, and they must be repressed from world scrutiny as if the citizens are puppets, robots, or perceived stupid by nature. Veracity was never the strong suit of the buffoonish-style of diplomacy of Hugo Chavez or his choice of successor, Nicolas Maduro. Truth had no place in Chavez’s Bolivarian Revolution as he misled an entire country, a revolution nurtured by and through Fidel Castro’s original failed Cuban revolution -- both, bringing death and misery to the people of Cuba and Venezuela over long periods of dictatorial rule. This while the Castro brothers and Chavez became wealthy and managed to hold on to power. What was the record of Hugo Chavez’s rule; what did his legacy leave; and what has Maduro done to perpetuate the Chavez/Castro ideology? It appears they are still on the same page this very day. The problem is that Maduro struggles to understand fact from fiction, while trudging on into an ever sinking pit of common personal and professional destruction which threatens to bring the nation down with him. The disastrous record left by Chavez shows massively squandered oil wealth, depleted with practically no record of accountability. Chavez’s sudden personal wealth -- now enjoyed by his heirs, is graphically archived in page after page on the Internet as “La fortuna de Hugo Chavez.” And one of Chavez’s most ironic and memorable quotes is also pasted on Internet pages of the world's media: “Ser rico es malo" (to be rich is bad). Although it did not start under Maduro’s continuation of Chavez doctrine, Venezuelans today are plagued by empty food market shelves. Staples such as milk, sugar, flour, eggs, and other grocery items are rare. As well, the nation is suffering from a decaying infrastructure, thousands of people are living in squalor, there are rolling blackouts of electricity, and related inconveniences.Being kept silenced, threatened, and imprisoned for speaking out was the last straw for the thousands and thousands who have taken to the streets to voice their outrage, with many willing to die for their beliefs. One of the cries heard throughout the now bloody demonstrations: “… days of protests for 15 years of silence.” To which, unfortunately, the roguish Maduro regime has replied with relentless retaliation. Silencing the media in Venezuela, and controlling what is seen and heard, began with Chavez and rapidly accelerated under Maduro. The only television station to regularly broadcast voices critical of the government was sold last year. Last week Maduro banned a foreign cable news channel after it showed images of a young protester shot to death. Subsequently he revoked the credentials of a CNN news team and sent them packing. As President Maduro voices strength and adherence to the socialist revolution, he ignores the truths and realities of his failures and blames the US for interference. So, how does he ignore the hundreds of thousands throughout Venezuela that are demanding to be heard and willing to tell him to his face where the blame lies? It appears that Maduro does not want to hear any of this, and most importantly -- he does not want the world media to report his own people echoing it. Jerry Brewer is C.E.O. of Criminal Justice International Associates, a global threat mitigation firm headquartered in northern Virginia. Venezuela has been living since the last 15 years a progressivily destruction, not only of its economical, social and political institutions, but most important of all,on its Freedom. 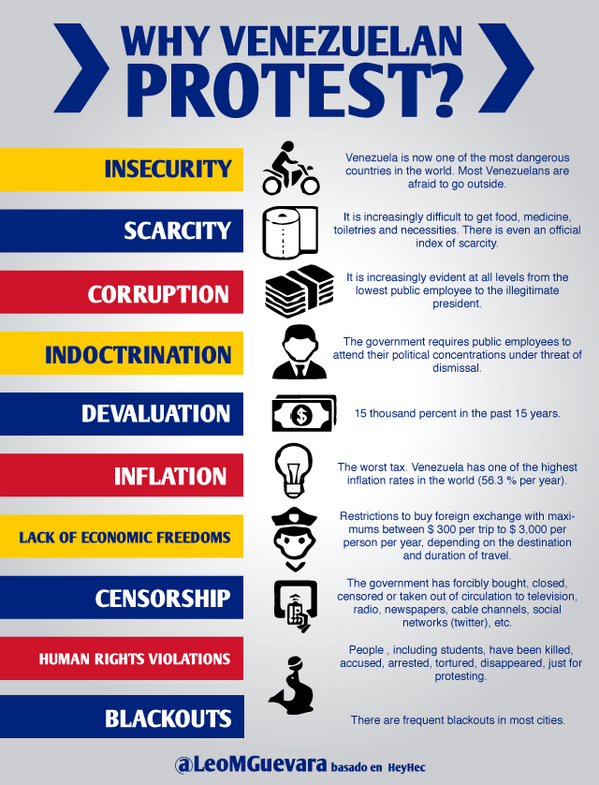 The protests that started the 8th of February, and became national the 12th,have been a huge cry, not only againts corruption, lack of food, impunity or insecurity, but a cry for Freedom. For protesting, for expressing our opinion,our rigths, againts the govermment, the last 12th of february 2 students were killed,220 were put in jailed, and many all still missing by a coward regime that fears to lose its power. The protest continues and the wounded and number of jailed continues raising. That is why students of Venezuela have decided not to recognised any ilegetimate goverment that oppressed, jailed and killed venezuelans who have been raising their rigths to express its anger againts the chaos that our country is living. The ones who died, who suffered, will not be forgotten. What the govermment calls 'justice' it's just another mechanism they use to oppres the democratic voices that claim freedom in our Nation and we will not recognised it. We don't want to continue living in a country where every 20 minutes a venezuelan its killed by crime, a country with the biggest reserve of oil in the world, but with the biggest debt an inflation in Latin America, where the Govermment have been closing TV stations,Radios and Newspapers because they oppose to the official opinion. We will not stand anymore againts this situation, that's why we are protesting. This is the figth that the students in Venezuela are having. The effort of the fellow students that has been killed, jailed or are missing will not be in vane. We are not going to stop protesting despising the repression or the fear that the ilegitimate govermment wants to apply us with its unproportional use of force. They have 'the justice',which is not fear, the army, the police, and all the institutions of the State, but we have a future to win,a country to build, and that is more than enough to figth againts this govermment. In this situation we ask to the international community one thing: support. The figth we are having to conquer our freedom it´s of live or death. VENEZUELAN POLICE STOMP STUDENT AND LEAVE HIM NAKED. I think we should all boycott Jose Antonio Abreu and Gustavo Dudamel!! I think the time has come for me as an ARTIST, VENEZUELAN, WOMAN AND MOTHER to write a letter to Jose Antonio Abreu and Gustavo Dudamel. I had not done it before out of affection and respect for Gustavo. But I cannot remain silent any longer. Yesterday, while tens of thousands of peaceful protesters marched all over Venezuela to express their frustration, pain and desperation at the total civic, moral, physical, economic and human break down of Venezuela, and while the government armed militias, National Guard AND police attacked, killed, injured, imprisoned and disappeared many innocent victims, Gustavo and Christian Vazquez led the orchestra in a concert celebrating Youth Day and the 39 years of the birth of EL Sistema. They played a CONCERT while their people were being massacred. I often use the analogy of the Titanic. The performing quartet sank with it while they continued to play their music. The music didn't help. The music didn't save them. Venezuela is sinking and El Sistema will sink with it. We have moved past the point of no return. Music, ambition and fame are worthless next to human suffering. They mean nothing when you are abused, injured and killed. No more excuses. No more "Artists are above and beyond everything". No more " We do it for the kids". The 200.000 people who have been murdered in the last 15 years due to rampant violence and the opprobrious actions and language of the government, matter more than any instrument, any ideology, any profession, any amount of money, and any personal satisfaction or gain. Those same children are growing up in a country that is no longer a safe haven for them, and it is the responsibility of the leaders to shine light on the truth of the REAL situation in my country. I love the musicians in El Sistema. Many of them are my friends and this has nothing to do with taking anything away from THEM, but the LEADERS have a moral duty to SPEAK UP and risk whatever is necessary in order to stand up against this dictatorship that we are now suppressed by. Venezuela is on fire and it will continue to burn until the Cubans, the government and its beneficiaries give up power. I would ask you to read the news, but there is nothing in the news. The grip of the government is such that the world remains silent, blind and deaf to us..